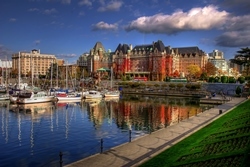 City in Brief: Victoria is the capital of British Columbia and is situated on the southern tip of Vancouver Island. The city, named after Queen Victoria, boasts a large number of historic buildings, one of the most famous being the Empress Hotel. Its large number of parks and green spaces has earned it the nickname “The Garden City,” and has made it a popular destination for tourists, including more than 500,000 annual visitors who arrive via cruise ships.